Can I have a countdown window show the time until next suspend? Occasionally I leave my computer unsuspended when I need to go somewhere but I am leaving it with people I absolutely trust and I will be back shortly so no real need to suspend (like if it's family and I'm just popping to the loo which is only a small distance away from where I am and you know, it's not convenient to always suspend my machine when it's like this), or there may be other reasons why I want this, like to know if I should run to my machine to wiggle the mouse before it goes to sleep, or if I can go to my computer at a slower pace. 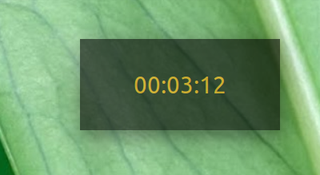 Anyway, to get to the point, I would like to be able to launch a countdown (preferably in a see-through (the see-through bit is not a must) window on top of everything in the top right hand corner of my screen just below the top bar) display which will show me a countdown to the next suspend time. This could either reset the timer every time I interact with the machine or somehow directly interface with the suspend system to tell when the next suspend is (because I assume that there is some sort of countdown). How could something like this be achieved (of course I would not want the window to always be open but instead for me to be able to run a command any time that would start the window, or it could even be a countdown in a Terminal window that I would just move or would automatically be located in the top right hand corner if the GUI bit is at all problematic)? I am running Ubuntu GNOME 15.10 with GNOME 3.18 but the solution should also work with Ubuntu GNOME 16.04 with GNOME 3.20 as I plan to upgrade soon. In the original answer, further below, the countdown window appeared after an arbitrary idle time. Re- reading your question, you might want it permanently. The permanent version is below (which is simpler), the original answer further down. The initial time is the idle- time before suspend should be activated. The time is reset on mouse- keyboard events. As the image shows, the script comes with different pre- set color options (see further below). to enter suspend after 5 minutes. The text color can be changed, as explained at the very bottom of the second version of the answer. 1b. As requested in a comment: luxury version of the same script: text color changes to yellow if half the time passed, to red 30 seconds before suspend. Use it exactly as 1a. The window is always on top of all other windows, exactly like the notification bubbles. The setup replaces the "normal" suspend settings, which means you need to disable suspend from system settings. which doesn't require sudo. The consequence is that you will need at least 15.04 to use this solution. To setup (detailed version further below), simply copy the three scripts involved into one and the same directory, exactly named as indicated. To run, simply run the main script (running the time- check). If the idle time exceeds a certain limit, the countdown window is called. If during countdown the computer becomes un- idle (mouse- or keyboard event) the window is closed (its pid is killed). Make all three scripts executable, and again, make sure they are in one and the same directory. to set idle time to 10 minutes, counter starts 5 minutes before suspend. I'm no good at writing scripts so this is all the help I can come up with ... hope it gives you a place to start. Is there a way to make suspend by closing the lid ALWAYS possible on a Samsung NC10? How to change name in top bar for an application in GNOME? What is the strange dot that appeared next to the time when gone midnight? How to make a daemon which checks if a program is running (at regular intervals) and starts it if it is not? How to fix missing characters from font after awakening from suspend?